The confrontation over Ukraine has the potential for spiraling out of control and could lead to "serious problems in the heart of Europe," warned former Secretary of State James Baker on March 9th. "It is clearly the most serious East-West confrontation since the end of the Cold War," Baker said on "Meet the Press." "For someone who was the last US-Secretary of State during the Cold War, it's very disappointing to me to see that we're moving now from cooperation with Russia to confrontation again. The risks are very substantial. I think we are pretty much in a "Cold War Lite," right now." Baker said he hopes a diplomatic solution can be reached because he thinks there's no good endgame for the Russian Federation. In truth, the Kremlin's tactical triumph in annexing Crimea without a shot being fired in anger has so stunned the West that the degree to which the West was outsmarted and out maneuvered has yet to sink in. Russia's de-facto annexation of the Black Sea peninsula does not threaten to plunge Europe towards a new Cold War. But it has caught German Chancellor Angela Merkel and US President Barack Obama flat footed, and they're struggling to come up with a response to Moscow's land grab. German Chancellor Merkel told an extraordinary EU summit in Brussels on March 9th, "One can't just go on like nothing has happened." All the Western political actors stepped up the empty rhetoric to a fever pitch last week, in a desperate attempt to persuade Russian kingpin Vladimir Putin out of formally annexing Crimea. Yet it wasMerkel who issued the most bellicose threats, warning Moscow on March 13th that it risked "massive" political and economic damage" if it refused to change course on Ukraine, saying Western leaders were united in their readiness to impose sanctions on Russia if necessary. "To make it unmistakably clear, no one among us wishes it will come to such measures. But we would all be ready for them and determined if they become unavoidable. If Russia continues with its policy of the past weeks, then this wouldn't only be a disaster for Ukraine. We as neighboring states would also regard this as a threat," Ms. Merkel warned. However, four days later, on March 17th, Russian kingpin Vladimir Putin called Merkel's bluff. He signed a decree recognizing Crimea as an independent state following its majority vote of 97% to secede from Ukraine and to join Russia in a referendum. Defying Western protests, Putin signed a treaty on March 18th, making Crimea part of Russia again. "In the hearts and minds of people, Crimea has always been and remains an inseparable part of Russia." Putin later told a flag-waving rally in Red Square. "Crimea has returned to home port." Putin showed no sign of backing down despite the threat of Western sanctions. "The so-called authorities in Kiev have stolen power in a coup, opening the way for extremists who would stop at nothing. Our Western partners headed by the United States prefer not to be guided by international law in their practical policies, but by the rule of the gun. They have come to believe in their exceptional-ism and their sense of being the chosen ones. That they can decide the destinies of the world, that it is only them who can be right," he said. Making clear the Kremlin's determination to stop the US-led NATO military alliance from expanding further into Ukraine, Putin declared, "We do not want a military organization to be bossing us around near our fence, next to our home or in our historical territories. You know, I cannot imagine us going to Sevastopol as NATO sailors' guests," Putin told the Federal Assembly on March 18th. In Moscow's view, Ukraine's role is to serve as a buffer state. The prospect of a new government in Kiev joining the European Union or even NATO is seen as a major threat, as would be the loss of the Russian Navy's warm-water port on the Black Sea. In turn, the rouble's relief rally helped to knock Russia's 10-year Treasury bond yield -27-basis points lower to 9.29% on March 20th, from a five year high of 9.57%. 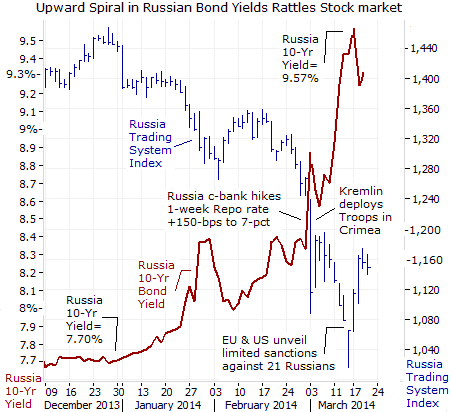 Still, Russian bond yields are considerably higher than the 7.70% level that prevailed on Dec 24th. Going forward, traders expect the Russian rouble's exchange rate versus a basket of the Euro and US$, to be the key driver influencing the direction of Russian bond yields. Behind the relief rally for the Russian markets, were clear messages sent across the newswires that the West had grudgingly accepted the loss of Crimea, and that both sides had agreed to a cease-fire. On March 18th, Russian kingpin Putin sought to reassure leaders in Berlin, Paris, and London, that Moscow did not seek any further division of Ukraine. "Fears have been expressed in Kiev that Russia might move on the Russian-speaking eastern parts of Ukraine, where there has been tension between some Russian-speakers and the new authorities. Don't believe those who try to frighten you with Russia and who scream that other regions will follow after Crimea. We do not want a partition of Ukraine," Putin declared. The next day, on March 19th, US President Obama said he had ruled out the use of military force in the Ukraine crisis, and that the international response to Russia's seizure of Crimea will be limited to diplomacy. "We are not going to be getting into a military excursion in Ukraine. What we are going to do is mobilize all of our diplomatic resources to make sure that we've got a strong international correlation that sends a clear message." In Moscow, bankers were greatly relieved that the situation hadn't deteriorated so far that Europe and the US-Treasury would detonate the "nuclear option" of freezing Euros and US-dollars held in Russian accounts overseas and forcing foreign banks out of bi-lateral trade. Instead, the EU took very mild steps of imposing travel bans and asset freezes on 21 Russian officials, while the US froze the assets of just seven ranking Kremlin officials. Destructive Trade War, The West is reluctant to take sanctions to the next level, because it could spiral into a destructive trade war that could topple Europe's wobbly economy into a "triple dip" recession. Cross-border trade between Europe and Russia was $460-billion last year, with Russo-German trade accounting for almost a quarter of the total dealings. Germany is dangerously reliant on Russian supply for 40% of its natural gas and crude oil needs. In turn, 300,000 German workers build vast quantities of precision machinery, chemicals and cars that are sold to Russia. This mutual economic dependency means Berlin has taken a more cautious approach toward levying sanctions on Moscow. In the wake of the West's initial response, which was viewed as nothing more than a light slap on the wrist directed at a specific few individuals, global stock markets rebounded sharply from the previous week's losses. Gold tumbled as much as $50 /oz. The US$-denominated Russian Trading System Index (RTS) which had slid deep into Bear market territory, enjoyed a "Dead Cat" bounce from its March 14th low, rebounding as much as +12% from its worst levels, to close around 1,155- points. Traders do not believe that the annexation of Crimea is enough to provoke tougher Western sanctions that would damage the Russian economy, and both sides have already agreed to a "Cold Peace" in the region. Russia is the EU's third-biggest customer. Western car-makers, retailers and household product companies have piled into Russia, eager to tap into Europe's second biggest retail market and Russia's highly educated and relatively cheap workforce. The likes of VW, Ford, GM, Renault and German engineering giant Liebherr, Boeing, Procter & Gamble, Pepsi, Unilever, Intel, John Deere, and British Petroleum, Chevron, General Electric, Caterpillar, Mars, Cargill, and Kraft Foods have invested ten of billions in production facilities in Russia and these companies are opposed to any attempt to impose biting economic sanctions on Russia. If the West decides to cross the line and impose really tough sanctions that actually bite, such as asset freezes on Russian kingpin Putin himself, or Russian companies and Oligarchs, Russia's foreign ministry promised "a broad range of retaliatory measures that won't go unnoticed in Washington. They will hit the US like a boomerang," Moscow warned on March 20th. That could cause even more volatility on both the Russian and European bourses. The German DAX-30 index was most affected among European stock markets, because of its leading trade position with Russia, - briefly tumbling to as low as 8,900 on March 14th, for a correction -10% off its recent high. According to the Bank for International Settlements, the Russians had $160-billion stashed away in foreign banks as of September 2013. On March 20th, Mr Putin told company bosses on Thursday to bring their assets home and clean up their businesses to help Russia survive Western sanctions over Crimea and an economic downturn. "Russian companies should be registered on the territory of our nation, in our country and have a transparent ownership structure. I am certain that this is also in your interests," Putin told the Oligarchs. Most importantly, Russian banks and corporations - most of them majority owned or controlled by the Kremlin, collectively owe a staggering $700-billion of debt to foreign lenders. Energy giants Rosneft and Gazprom owe $90-billion combined to foreign entities; the four state banks Sberbank, VTB, VEB, and Rosselkhozbank owe $60-billion. Some of this debt matures this year and next year. European banks and insurance companies are up to their eyeballs in this potentially toxic Russian debt. When it comes due, it will have to be rolled over, and some of the companies will need to borrow more, simply to stay afloat. Alas, the current sanction regime of visa bans for the elite, asset freezes, and trade restrictions could make that difficult. Then there's the threat, now more broadly but still unofficially bandied about, that Russian companies should simply default on this $730-billion in debt in retaliation for the sanctions.Sergei Glazyev, an economic adviser to Russian President Vladimir Putin, said on March 18th, "If the US chooses to freeze our assets, then our equities and liabilities in dollars will also be frozen. This means that our banks and businesses will not return the loans to American partners," he warned. The Battle over the Russian Rouble, As such, on March 13th, former Fed chief Alan Greenspan told CNBC in a "Squawk Box" interview that the West's best options ofblocking the Kremlin from further aggression, is to "affect their financial system significantly that it creates deterioration within Russia." 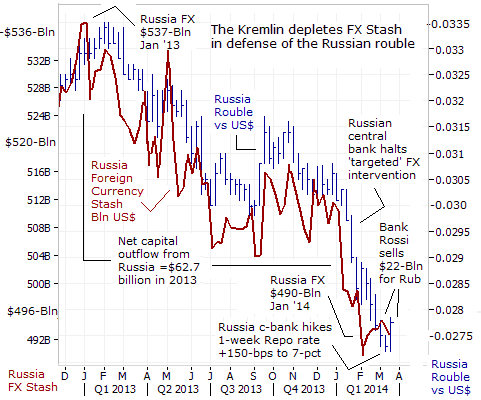 "Diplomacy is really far less important than the stock movements within Russia. In past confrontations there really wasn't much of a stock market in Moscow," he said. However,"The ruble has been deteriorating in a way that clearly has a major effect on the Russian economy, which you know is not doing well. If that happens, there will be a response from Russia, but only in that case," Greenspan said. The Russian rouble has tumbled -20% against the US-dollar and has lost -27% of its value against the Euro compared with a year ago. 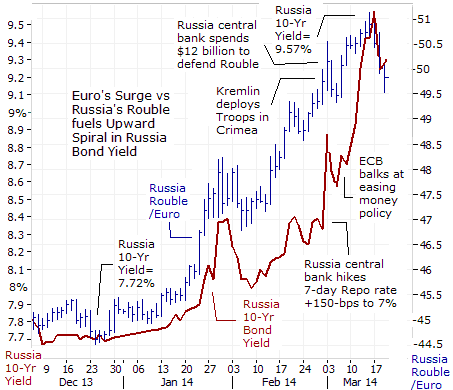 A weaker rouble increases the costs of imports for Russian consumers, and in turn, fans a faster rate of inflation. The Russian consumer price index (CPI) is +6.2% higher compared with a year ago. The CPI might be even higher, except for the dampening influence of a weakening Russian economy that is barely growing at a tepid +0.7% annualized rate in January. However, a faster rate of inflation, and higher borrowing costs for Russian companies, caused by a weaker rouble, can sink the Russian economy into a recession later this year. And that's the secret G-7 game plan, - working to weaken the Russian rouble, and exert upward pressure on Russian interest rates, in order to topple the Russian economy into a severe recession, and ultimately force the Kremlin to roll back its takeover of Crimea. Moscow's ability to defend it currency in the foreign exchange market, depends partly on the size of it foreign currency reserves. In an effort to preserve its FX-stash, on January 13th, the Russian central bank said it would cease "targeted" interventions on the currency market as part of a strategic shift towards letting the rouble float completely freely. Bank Rossi was depleting its FX reserves, in order to counter net capital outflows that had reached $62.7-billion in 2013, $54.6-billion in 2012, and $84-billion in 2011. The Russian central bank estimates that around $50-billion per year, or 2.5% of Russia's economic output, is earned illegally in a vast underground economy, andis whisked out of the country. The dirty money enriches a small business and criminal elite at the expense of the broader citizenry, and it flourishes because the Kremlin is unwilling to do much about cracking down on corruption, making property rights more enforceable, or making courts believable through judicial reform. Of the total illegal outflow, the central bank figures 30% is linked to trade, with 70% made up of dubious, capital transfers, through a vast state money-laundering scheme. Big state enterprises in particular are involved in shifting large sums of cash abroad, and Russia's Oligarchs use offshore centers to safeguard businesses. Alexei Kudrin, chief economist of the Russian president's Economic Council, said on March 13th, that capital flight from Russia might accelerate to $50-billion per quarter in 2014, if harsher sanctions are imposed on the country over the Ukrainian crisis. "If the sanctions only affect the accounts of certain individuals, enterprises, operations or products, this will be a mild scenario," Kudrin said. Still, capital flight, uncertainty and the higher interest rates needed to support the ruble will take their toll on Russia. Like the Soviet Union in the 1980's, Russia cannot afford a cold war. It said that Russia is in effect ejecting itself from the BRICS. Yet in a strange way, Moscow figures that Western sanctions on foreign bank accounts might act to discourage the vast amount of dirty money flows out of the country. Since the Russian military invaded Crimea on March 3rd, the Russian central bank has been forced to abandon its "flexible" approach to managing its currency, and instead, was forced to burn through a sizeable chunk of its massive FX stash, selling $22-billion to defend the rouble. Bank Rossi has also jacked-up its 1-week repo rate by +150-basis points to 7-percent, to tighten liquidity, saying the decision was aimed at preventing "risks to inflation and financial stability associated with the recently increased level of volatility in the financial markets." The yield on Russia's 3-month bank deposit rates has shot up even higher to 9.32% today, compared with around 7.25% at the start of the year. Moscow's ability to win the battle over the Russian rouble, depends to a large extent on its ability to continue to rack-up trade surpluses, that can replenish its stock of foreign currency reserves. Russia earns a net $16-billion per month, on average through foreign trade. Russia's trade surpluses are largely fuels by exports of industrial commodities, such as aluminum, diamonds, crude oil, natural gas, palladium, nickel, platinum, and timber. Russia is the world's largest producer of palladium, used in the auto industry for making catalytic converters for gasoline-powered vehicles. Russia also controls 15% of the world's platinum supply and is a big supplier of titanium, a vital metal used by the aerospace industry. From less than 50% in the mid-1990s, the share of commodities in Russian exports has grown to 70% today, with oil accounting for more than half of export income. Equaling 20% of the country's GDP and half of its economic growth since 2000, hydrocarbons provide half of the Kremlin's budget revenues. 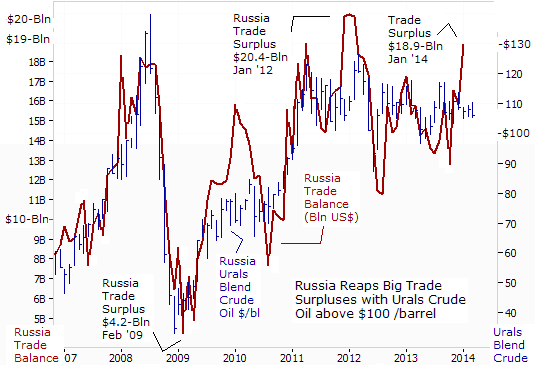 Alexei Kudrin, former finance minister, estimated the Kremlin's break-even price at $117 per barrel last year. The legacy of the Russian petro-gas state is the centrality of oil and natural gas revenues, which amounted to $215-billion last year. The difficulty with enacting effective sanctions against Russia lies in Western Europe, where many nations now depend on cheap Russian natural gas to fuel their economies. Germany leads the group, purchasing 40% of its natural gas from Russia. Czechoslovakia, Finland and Ukraine, receive 100% of their natural gas from Russia. Poland receives 82% of its energy from Moscow. Thus, Putin has been credited with strengthening Russia's economic leverage. Though Russia still has economic challenges, Europe's dependence on Russian gas supplies gives Putin a trump card that did not exist during the post-Soviet chaos of the 1990's. Recently, Russia's gas champion Gazprom upped the stakes by threatening Ukraine with a repeat of the 2009 crisis over $2-billion of unpaid debts. "Russia's bet on using the gas weapon is working," said daily business newspaper Vedomosti. Despite sharp criticism of Russia's takeover of Crimea, there clearly is little appetite in Europe or the US for either a military confrontation with Moscow or meaningful economic sanctions. The risk for Russia on the currency markets is cushioned by the Kremlin's huge war chest of forex reserves -- which stood at $492-billion on March 14th.The economic pain imposed on both sides by Iranian-style sanctions would be extreme. Unlike Europe, however, Russia's tolerance for economic pain is almost limitless, as has been repeatedly demonstrated throughout history. In any contest over pain thresholds, Russia would win hands down. Disruption of natural gas supply could be even more troublesome, given that Russia is the world's largest exporter, supplying more than a third of Western Europe's gas. So Moscow has a knife pointed at Europe's economic throat. It seems clear that no one either in Europe or in the White House has the will to take effective measures against the Russians. The media handwringing over whether Putin is "crazy" obscures the fact that Putin is a very smart power player on the world stage. Contrary to Mr Greenspan's theory that a severe loss in the value of the Russian stock market would stifle Moscow's aggression, it's probable that the Kremlin's main focus is centered on the gyrations in the prices of commodities. An ECB source had predicted on March 3rd, there would be unanimous agreement to end so-called sterilization of the bond purchases that would inject about €175-billion ($242-billion) of excess liquidity into the Euro zone financial system. Strangely, the ECB opted to forgo a widely expected easing of its monetary policy. Perhaps, the ECB's tougher than expected stance is related to the political wishes of the EU's ruling class, which desires to keep the pressure on the Russian rouble via the Euro exchange rate. Likewise, the Federal Reserve surprised traders on March 19th, when it shortened its timetable for winding down QE-3, and even hinted at baby step rate hikes beginning ahead of schedule around April '15. A tightening of excess liquidity in the Euro-zone's and US's banking system in the months ahead, can keep the Russian rouble and other Emerging market currencies, pinned down at current levels, or even weaken their exchange rates further versus the Euro and US$. 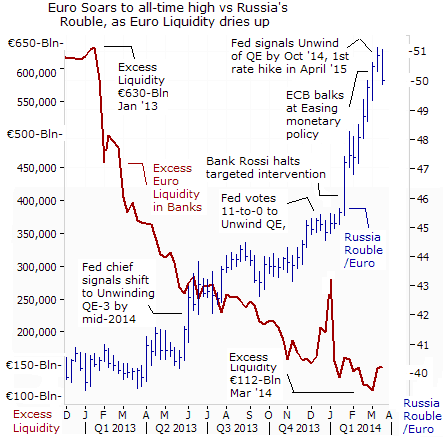 In regards to Russia, the weaker rouble helps the West to indirectly exert upward pressure on Russian interest rates. However, Putin is betting that his Petro state can withstand the pain, as the Fed slowly turns off the QE money spigot in the year ahead. or call 561-391- 8008, to order, Sunday thru Thursday, 9-am to 9-pm EST, and on Friday 9-am to 5-pm. Copyright © 2005-2014 SirChartsAlot, Inc. All rights reserved.